Andrea's Bits and Scraps and Little Ironies: Eeek! I came into to room a few days ago to find my 4 year old daughter had climbed up on a trunk to look out the window. I went over and looked out for a minute with her and then I noticed that she was kneeling on my graphics tablet, which was sitting on the trunk (picture me in shock!) I was sure it would be broken. I tried it out and it didn't work. So, I decided to replace the battery in the pen. It worked!!! So, I have this template for you with a doodle I created with the graphics tablet! Whew! A commercial license is also available for them HERE. What a pleasant surprise to see all the wonderful goodies that you are sharing with us today. 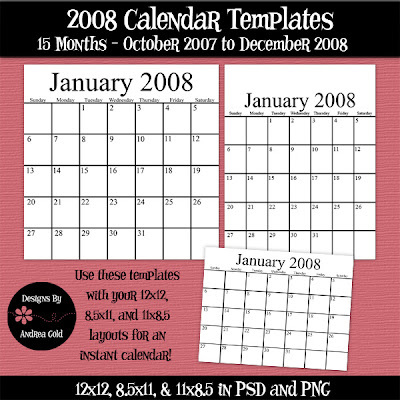 In addition, thanks for the sampler of the calendar in the various sizes that you include within each template you give us. 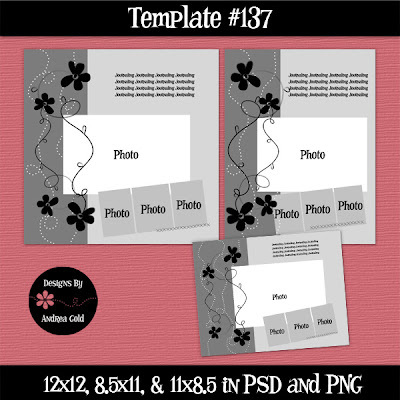 I feel a little sad at times, when I open your templates to scrap, knowing that I will not use the 12x12. I can't come up with another solutions, but I am working on it. I know, I will reduce it to a smaller square size for a small album. Yeah, now that makes me feel a whole lot better. So glad to hear that your Wacon survived the dynamic work job that your dearling placed upon it. I wasn't so fortunate. I blame my eldest daughter for my loss. She left a glass full of juice by my computer which is a no, no, in my home. My great-grandson tried to move it. There went my Wacon. I will put another one on my birthday list for December with a strong hint. LOL. So glad about the potty training. When they are ready and not before, it will begin to come together. So I will have to get an electrician in and I dread knowing what they are going to charge, just for the fun of it. But I am hooked up to the Internet through a long- long cable so that I could get online tonight. Wish me success with the electricity or that my youngest son can find out the problems and eliminate the high-priced service person. Anyway, it has been fun visiting you and GDS. 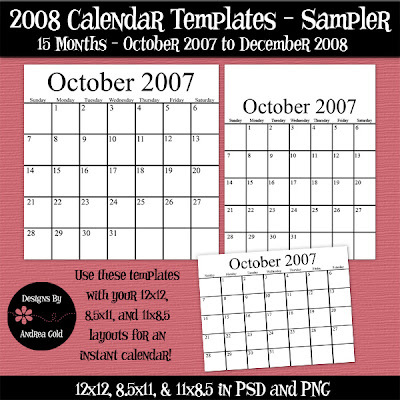 I hope you have some samplers available of kits at your site. Otherwise, have a wonderful and loving day. thanks for the template! And WHEW on the survival of your tablet! Thanks for the templates Andrea. I'm so glad your Wacom was ok. Kids can be a handfull at times. I still remember your story about how she had painted your Mom's table legs...lol. Our best wish for our children is that they have one just like themselves when they grow up..lol. Yikes! So glad she didn't squish it to pieces! The Eeek story was a good read. Glad you were still able to create those doodles in your gadget. :) thanks for the templates too, too bad 4shared doesn't load though. I'll come back and retry later :) thanks again! I can well imagine your shock. Probably like mine when the Princess spilled her drink on mine. It still worked but couldn't get all the sticky out of under it. Fortunately I was ready to buy a new one anyway. Thank you for the wonderful templates today. Thanks so much for the template! Thank goodness your tablet was ok.
Hi Andrea! Yes, again - another awesome template! TFS!!! You know I love coming here and seeing all that you do on your blog and things going on with you shop... girl, of course I thought of you when it came time to pass along the Creative Blogger Award!! You inspire me! Thanks for all that you do!